Originally Written and Posted at Epinions.com on 1/1/10. 2008 was the year vampires became popular in the world of pop culture. In the world of TV, True Blood based on the Sookie Stackhouse novels was a hit show on HBO that would later spawn another hit vampire TV show on the CW. In the world of movies, vampires came back in a big way thanks to the Twilight film series based on Stephanie Meyers' best-selling novels. Yet, not everyone was happy about new surge of popularity of vampires as another film from Sweden came out that really put a new spin on the creatures based on a hit novel from Europe. 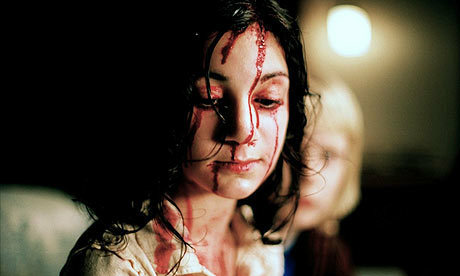 It would also be considered to be one of the most sympathetic portrayals of a vampire entitled Lat den ratte komma in (Let the Right One In). Directed by Tomas Alfredson and written by John Ajvide Lindqvist based on his novel, Lat den ratte komma in tells the story of a bullied 12-year old boy who befriends a vampire child at a suburb of Stockholm in the early 1980s. The friendship becomes an escape for the 12 year old boy from his troubled home life as the boy also decides to fight back against his tormentors with the help of his new vampire friend. Starring Kare Hedebrant, Lina Leandersson, Per Ragnar, and Peter Carlberg. La den ratte komma in is a haunting yet engrossing masterpiece from Tomas Alfredson. It's the early 1980s at a small Swedish town of Blackeberg during a cold winter as a young 12-year old boy named Oskar (Kare Hedebrant) is looking at his window where an old man and a young girl are moving into the apartment Oskar lives with his mother (Karin Bergquist) while his father (Henrik Dahl) lives in a nearby place in the forest. Oskar's life in school is full of torment as he is often bullied by a group of boys led by Conny (Patrik Rydmark). Oskar wants to fight back but is too weak until he meets his new neighbor in the 12-year old Eli (Lina Leandersson with the voice of Elif Ceylan). The pale young girl is seen wearing a shirt without sleeves during the snow as Oskar is intrigued by her. Living with Eli is a man named Hakan (Per Ragnar) who has been trying to kill some locals to get some blood but often would encounter trouble. The news of mysterious murders have been circulating throughout with Oskar reading as he starts to befriend Eli by giving her his Rubik's Cube. Even as they begin to communicate through Morse Code as they live next door to each other. With Hakan trying to do his duties to kill people, things went wrong as he gave up in his duties. Forced to go to the hospital following a self-inflicted accident, Hakan sees Eli, who is revealed to be a vampire, as she lets Hakan go. With Oskar taking on swimming fitness training, his friendship Eli grows as he tries to make it official through a blood bond. Instead, Oskar has a huge discovery about Eli. The reaction has Eli attacking a woman named Virginia (Ika Nord) almost to her death as Virginia's boyfriend Lacke (Peter Carlberg) wants to find Eli after realizing who had killed his friend Jocke (Mikael Rahm) earlier. Eli goes into hiding though she still communicates to Oskar through Morse Code. With Virginia becoming troubled by her new infection following a visit to Lacke and friend Gosta (Karl Robert Lindgren) where she is attacked by Gosta's cats. With Eli now in trouble, Oskar helps her only to realize how much trouble it would be to help Eli. The story about a 12-year old boy befriending a vampire in the body of a 12-year old girl is definitely an interesting story. Yet, the film is mixture of horror, light-humor, drama, and romance. It's really about this building friendship between a boy and a vampire who is helped to fend off bullies while making a horrific discovery about this girl he had just met. At the same time, we see the girl known as Eli try to survive in what she's meant to do as a vampire. Still, it's not easy for her as the man who was supposed to help her is often encountering lots of trouble that makes his job harder and eventually, he couldn't do it anymore. The screenplay written by the book's novelist John Ajvide Lindqvist is definitely filled with lot of comical and moments of horror. Yet, the heart of the story is the relationship between Eli and Oskar. Particularly for Eli, who is a vampire that despite her actions, is a very innocent character who is trying to find some form of companionship while trying to survive through blood. For Oskar, Eli becomes the one true friend he probably has while he is dealing with bullies who torment him. Eli helps Oskar get a chance to deal with them where at one scene, he does stand up for himself during a field trip where it would later set up a climatic moment between Oskar and his bullies. Lindqvist also writes realistic adult characters where the teachers are really there for the kids as is Oskar's parents despite their separation as well as other individuals shown throughout the film. The script is truly inventive and is filled with lots of romantic and sometimes, tragic elements in relation to the relationship between Oskar and Eli. The direction of Tomas Alfredson is truly spectacular in its sense of atmosphere of how the film is told. The film starts off with very little close-ups as Alfredson shoots everything from the back of Oskar's head in order to reveal Oskar's sense of detachment from the world where he's dealing with the fact that his mother works a lot. His dad isn't around living in another place and drinks a lot while his school life is even worse. By the time Eli appears to Oskar, the camera becomes closer while would often leave a wide depth of field to show where Oskar is at along with the town itself. Even at night where something is about to happen with a level of suspense. The special effects created for the film are spectacular as Alfredson uses the effects for Eli's own special powers as a vampire but without anything that is very CGI-created or anything. Instead, whenever Eli attacks, it's often by a moment of surprise or when it is least expected. That level of suspense works where it's not too creepy but also not underplayed. Alfredson's direction in the horror elements are brilliant but he's best in the more dramatic elements of the film by engaging the camera into the interactions between Eli and Oskar which is very innocent throughout the film. The overall work of Alfredson's direction is phenomenal in its stylish yet atmospheric tone. Cinematographer Hoyte Van Hoytema does brilliant work with the film's colorful yet ethereal photography with great shots of the snow in the day and nighttime exterior settings including the sunny locations with shots of snow falling. The interior scenes are also well-lit, notably the apartment of Eli to convey a creepy atmosphere while some of the nighttime exteriors have a chilling feel with its shadows and bright lights as Van Hoytema's work is superb. The editing by Tomas Alfredson and Daniel Jonsater is great in its fast-paced cuts for some of the film's suspenseful moments while being mostly straightforward and leisurely-paced in its transitions and such. Even with rhythmic cuts to convey Oskar's life and all of its troubles despite some warm moments in his home life and notably with Eli. Production designer Eva Noren does fantastic work with the look of Eli's decayed apartment with shades all around the windows. The look of the school and places are great including a horrifying sequence involving a body inside a block of ice. Costume/makeup designer Maria Strid does amazing work with the film's clothing which is mostly straightforward with Eli having a more decayed look of just a shirt and pants with few times she's wearing a dress. The makeup work is a real technical highlight including a horrifying scene of Eli bleeding all over face with all of this fake blood that looks so real. The sound editing of Per Sundstrom is great for its level of suspense as well as conveying the atmosphere of the location of where the story is taking place while there's a great, light-hearted scene between Oskar and his mother where they're brushing their teeth where the sound work is great in that scene. The music of Johan Soderqvist is really one of the best film scores ever created. Mostly an orchestral score, the pieces that Soderqvist creates play with the mood of the film from serene, enchanting moments of drama and romanticism to some intense arrangements for the film's horror and suspense moments. The score of Soderqvist is the film's best technical highlight as it without a doubt, an amazing score piece. The film's soundtrack includes various pop music tracks including an old 1968 pop song from then-future ABBA member Agnetha Faltskog and an 80s pop song from Swedish band Secret Service in one of the film's climatic moments. The casting by Anna Zackrisson is phenomenal with some memorable small roles from Kasja Linderholm as Oskar's teacher, Cayetano Ruiz as Oskar's gym teacher, Soren Kallstigen as a friend of Oskar's dad, Karl Robert Lindgren as Lacke's cat-loving friend Goste, and Anders T. Peedu as a victim of Hakan who is about to be tortured for blood. Other notable small roles from Karin Bergquist as Oskar's workaholic mother and Henrik Dahl as Oskar's loving but alcoholic father are very good as is Mikael Rahm as one of the first unfortunate victims of Eli. In the roles of the bullies, there's Johan Somnes as a reluctant bully while Mikael Erhardsson as a vicious one named Martin. Patrik Rydmark is very brutal as the bully Conny while Rasmus Luthander is even more vicious Jimmy, Conny's older brother, in the film's climatic confrontation. Per Ragnar is very good as Eli's helper Hakan who has trouble doing his job with all of these obstacles. Ika Nord is great in a small but memorable role as an unfortunate victim of Eli who ends up dealing with the effects of a vampire bite while Peter Carlberg is excellent as the boyfriend who wants revenge. The film's best performances easily goes to the two young actors in the film in Lina Leandersson and Kare Hedebrant. Leandersson's role as Eli, the child-like vampire is definitely one of the most chilling yet sympathetic portrayals of a vampire. Childlike but also wise, it is definitely a character that looks innocent but something is definitely off about her as it is truly a mesmerizing performance for the young actress. Hedebrant is superb in capturing the troubles of what a kid goes through in dealing with a troubled school life as well as divorced parents. Hedebrant's sense of innocence as well as wanting to play out violent fantasies is done in a very straight manner. The chemistry between the two young actors is stunning in its portrayal of two young people while there's an element of a young romance that isn't melodramatic or playing up for laughs. Both Lina Leandersson and Kare Hedebrant are the heart and souls of the film. The Region 1 DVD from Magnolia and Magnet Releasing presents the film the 2:35:1 anamorphic widescreen ratio along with 5.1 and 2.0 Dolby Digital Surround Sound in both Swedish and English dub. One of the most controversial additions of the DVD that has infuriated fans of the film that had seen the film in its theatrical release is the English subtitles. While an eight-minute behind the scenes special shows part of what was translated in the theatrical version. The DVD subtitles do have an affect on the dialogue and language of the film which is something that is confusing for audiences who didn't see the film in its theatrical run. The eight-minute behind the scenes featurette is mostly an interview with director Tomas Alfredson who talks about the film and making it which includes footage of the actors performing on certain key scenes. Notably shots of the film with its original English subtitles which is less stylized than the American subtitles. Another big special feature on the DVD is six minutes worth of four deleted scenes. Two of them feature interactions with Eli and Oskar inside the apartment and outside of the apartment. A scene of Oskar tormented by his bullies and one where the character of Virginia deals with the aftereffects of being bitten by Eli. Two photo galleries appear in the DVD including a gallery of posters from various countries and still shots from the film. La den ratte komma in is a remarkable film from Tomas Alfredson. Fans of vampire films will see this as definitely of the best films about the creatures with top-notch performances from Lina Leandersson and Kare Hedebrant as the young characters in the film. Filled with great special effects, chilling suspense, haunting dramatic elements, top production values, and an amazing film score. This is definitely a mesmerizing film that really brings the vampires back to a sense of realism and fantasy without all of the teenage melodrama in the Twilight film series. In the end, La den ratte komma in is a marvelous yet evocative masterpiece that captures the trouble innocence and nature of the vampire. Thanks for a great and - as always - throughful review of a movie I love. I just had a small remark: Blackeberg isn't really a small town on its own. It's a less-than-thrilling suburb of Stockholm. Maybe that's more apparent in the book or perhaps it's just taken for granted and hard to spot if you're not native. My second remark is about Eli. Since I read the novel (or rather heard it read to me in a wonderful audio with the author himself), I may mismind me. Perhaps Eli IS clearly a girl in the movie. In the novel it's not as clear that Eli is a "she". Eli is a bit of both and you never know quite which - perhaps he/she a transgender of either sort and it really doesn't matter that much which. You're welcome. I would love to go to Sweden one day. Maybe just to see what it was about. I haven't read the book but then again, I'd rather not. I much prefer keeping the book and film separate as 2 different things. I agree that you should try watch and judge movies and films as different things. But I wouldn't advice against reading this one. It's a very good novel in its own and I don't think it will take away anything from the movie if you tread it as well. Well, if I have the time and desire, I'll check out the novel. I just saw some of the American remake. It's all right but it lacks the charm and humor of the original film. Just a great film that blended the horror of the vampire films and the bittersweet romance and gentleness of little kid dramas so well. Nice review Steven! @Dan-Thanks. That's one of the reasons why I enjoyed the film. I just wish it got a better DVD release.